The white-painted bicycle appeared between the afternoons of Tuesday and Wednesday. 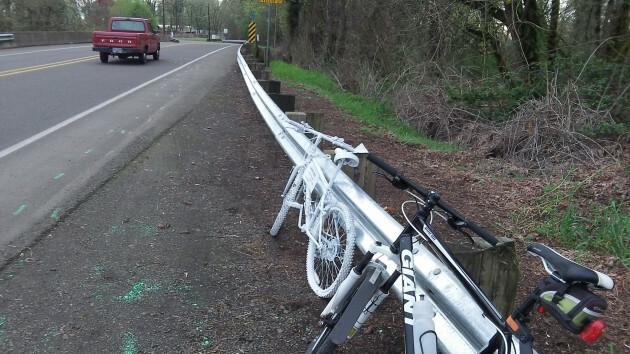 If drivers pay attention as they pass the spot in Albany where Queen Avenue makes a turn and becomes Oakville Road, they now see a white bicycle chained to the guardrail. It’s a “ghost bike,” the sign informs people like me who travel that road and stop to take a closer look. The display is a memorial to Grant Keith Garner, the 60-year-old bicyclist who was killed at that spot at about 5:45 p.m. on Feb. 17, when a driver coming from the south on Oakville lost control of her car going through the curve. The car caromed between guardrails on opposite sides of the road before it hit Garner on his bike. He had taken the bus from his job in Corvallis and was cycling the last leg of the commute to his home off Riverside Drive. 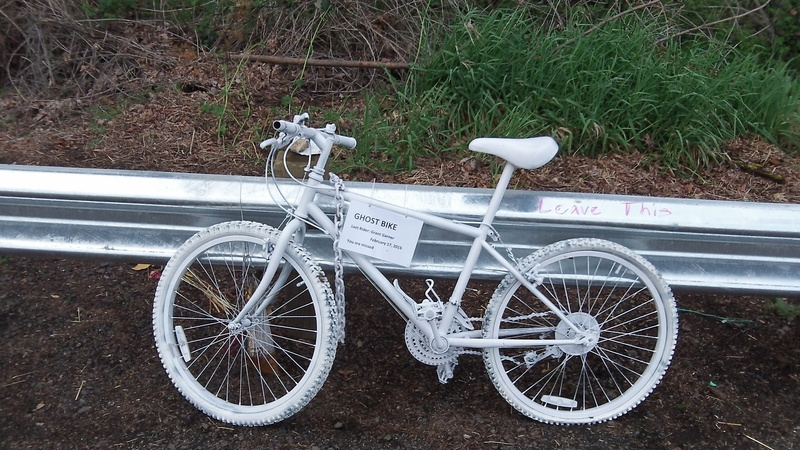 Before the white bike materialized — it wasn’t there Tuesday and I saw it Wednesday afternoon — the site had been marked with a bouquet and a paper note, held down by a small rock on one of the guardrail posts. I could not make out the words on the note, made illegible by rain, but there’s no mistaking the message of the ghost bike. I stopped my bike to take a closer look on Wednesday. I’ve been wondering about the official aftermath of this traffic death. Has any enforcement action been taken against the driver, identified in the initial press statement from the Linn County Sheriff’s Office as a 24-year-old woman from Corvallis? This week I asked the sheriff’s office about the crash investigation. A woman in the records office told me the report was on its way to the Linn County district attorney. There, George Eder, the senior deputy district attorney, checked around and then told me the report from the sheriff had not yet been received. It’s a poignant gesture but most drivers will wiz by it without even seeing it. I can imagine the DA will be doing his/her part and it won’t be a snap judgment. The driver’s speed at the time will be a big factor. Trouble is, if driver is charged/convicted of a crime, her insurance may not pay on a claim.